During her 23 years at Laurier, Associate Professor Mercedes Rowinsky-Geurts has made her mark on teaching practice as an instructor, on student experience as associate dean of student affairs and on international education as a mentor to educators in Mexico and South America. Looking back, she says accepting a teaching position at Laurier more than two decades ago was an easy choice. “I fell in love with Laurier and believed that the institutional culture would allow me to realize my full potential as an educator,” says Rowinsky-Geurts. Rowinsky-Geurts first arrived Canada from Uruguay during the late 1970s. She landed in Toronto with a teaching degree and held several jobs while completing her PhD, eventually joining the joint Laurier-University of Waterloo Spanish program in 1994. Today, Rowinsky-Geurts is an instructor in Laurier's Department of Languages and Literatures. Students in the Laurier community have certainly benefitted from Rowinsky-Geurts' teaching abilities during the past two decades. At Laurier, she received an Award for Teaching Excellence in 2000, a Faculty Mentoring Award in 2005, a Residence Academic Partnership Award in 2010 and a Laurier Teaching Fellowship in 2014. She was also awarded the prestigious 3M National Teaching Fellowship in 2008 and in 2012 was honoured with an Ontario Undergraduate Student Alliance Award for Teaching Excellence. Rowinsky-Geurts was also recently named one of the 10 most influential Hispanic Canadians by the Canadian Hispanic Business Alliance. 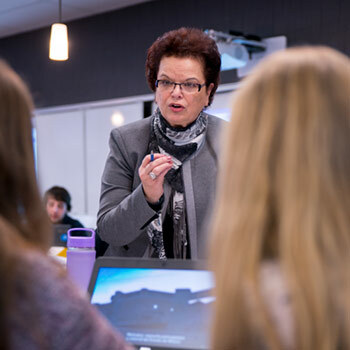 Rowinsky-Geurts has made an impact within Laurier’s Department of Languages and Literatures through the development of courses and curriculum, including Laurier’s first full-year course in Spanish. As an associate dean, she also made an impact by bringing the first active learning classroom to Laurier in 2012. Active learning classrooms feature movable furniture, technology that enhances learning experiences, and layouts that encourage instructors to teach throughout the entire classroom. In practice, active learning involves engaging students in hands-on activities and discussions that bring course content to life. Rowinsky-Geurts' work in the area of active learning continued after she was named one of Laurier’s inaugural teaching fellows in 2014. Active learning can take many forms, but Rowinsky-Geurts says it is important to create unique experiences for students through classroom activities. “My classes are a commotion – and they should be,” she says. “A student’s passion for a subject can be bred through active learning and that requires us to bring creative, intentional distractions into our courses. Rowinsky-Geurts says research shows that balancing time spent lecturing with opportunities for students to actively engage with each other leads to deeper learning. She encourages all of her teaching colleagues to consider bringing an element of active learning into their courses. During the summer of 2017, Rowinsky-Geurts travelled to Mexico and Columbia to provide active learning workshops to elementary and post-secondary educators. The opportunity to travel abroad and share her knowledge is one of the ripple effects of being recognized for her teaching practices. “I am fortunate for the chance to travel to share my work and research with others," she says. "But I also use these experiences as a chance to learn from others and further inspire my own teaching."